Canon climbed another stepping-stone in the DSLR market. This time something for the professional users, as it released the Canon EOS 5D Mark III On 2nd March, 2012, keeping the heat on. The Canon EOS 5D Mark III is the latest and the most advanced in its Full-Frame 5D series. The 5D series has been an important one for canon up till now. In 2005 Canon released the Canon EOS 5D the first in the 5D series and a joy for the pockets for many professionals. Later, The Canon EOS 5D Mark II enthralled professionals worldwide with its full frame video recording capabilities. And now, the Canon EOS 5D Mark III is out there to flare the magic in the Digital photography arena. It is bundled with some great features for both still and video shooters. Borrowing technologies, features and designs from some of the latest releases of canon like the Canon 7D and Canon 1D-X. Initially priced at $3500 in USA, it is worth for money if you are looking for better Image quality and performance. Canon introduced for the first time the 61 point AF system in its 5D series which was previously only seen in the Canon 1D-X. 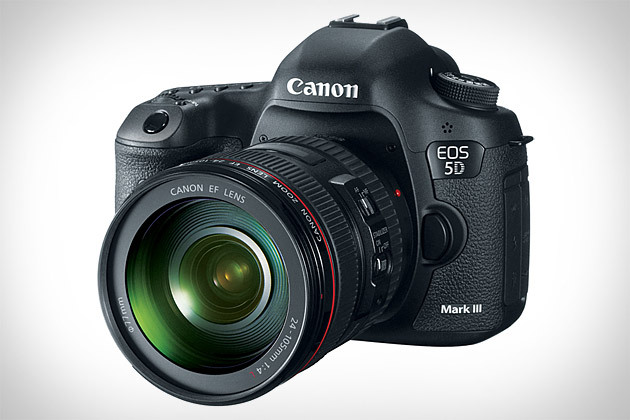 The Canon EOS 5D Mark III is the most advanced camera by canon till date. It is a 22.3-megapixel (5760 × 3840), full-frame CMOS censor (36 × 24) camera. Powered with the DIGIC 5+ image processor, ISO range of 100–25600 and expandable to 102400, 61 Point AF system, six frames per second continuous shooting, Larger LCD of 3.2-inch and the list goes on… Only the 36.3 megapixel Nikon D800 outnumbers the Canon EOS 5D Mark III in terms of megapixels but the latter still has a number of features which promise the buyers a better deal. Canon added a few entirely new features. It is the first in the Canon`s arsenal to have the in built High Dynamic Review shooting capability. The user-friendly autobracketing system offers up to seven frames thus covering a vast +/- 8 EV range. The same range can be used while you are in the recording mode. The introduction of the new Automatic Lens Optimization which can correct the light falloff and lateral color fringes that are introduced due the lenses. The user is able to store correct data for lenses in the camera. It comes with profiles for 27 lenses already created and the user has the option to store profiles of as many as 40 different lenses. It also includes a new side-by-side image comparison option. Headphone connectivity to monitor audio. In addition to the above canon also fixed a few glitches like the depth of field button fix and placing the power switch on the top. For professionals who were keenly waiting for the latest release in the 5D series here is a quick comparison between the last two releases in the canon 5D series. I will give a thumbs up to the Canon EOS 5D Mark III and recommend this amazing camera to serious photographers. Very nicely review and comparison of the models. Thanks on your marvelous posting! I definitely enjoyed reading it, you happen to be a great author. come back very soon. I want to encourage you to continue your great work, have a nice afternoon! I will surely try to continue writing. Aw, this was an extremely nice post. Taking the time and actual effort to produce a superb article… but what can I say… I procrastinate a lot and don’t manage to get anything done. Your content is excellent but with pics and clips, this site could undeniably be one of the most beneficial in its niche. #ask fm tracker online whilst I was writing this post I did not think about adding a graphics or a picture. Adding one would surely pop up the page and I would keep this in mind when I attempt to write my next blog. Thanks a lot for your enlightening comment. pleasant and the viewers are actually sharing good thoughts. post to be updated daily. It contains fastidious stuff. killing my time here at net, but I know I am getting experience everyday by reading such pleasant articles or reviews. great author.I will be sure to bookmark your blog and will come back down the road. Hello there! I could have sworn I’ve visited this site before but after looking at some of the posts I realized it’s new to me. Thanks for fantastic information I was searching for this information for my mission. It’s in point of fact a great and helpful piece of information. I am satisfied that you shared this useful info with us. it and i also have you saved to fav to see new information on your blog. Incredible! This website looks just like my old one! Wow, this paragraph is nice, my sister is analyzing such things, therefore I will inform her. space to eliminate my problem. May be that’s you! .. I’m not actually using WIFI, just 3G .. Anyways, awesome blog! are supposed to be shared over the internet. Shame on Google for not any longer positioning this build higher! your stuff previous to and you’re just too great. I really like what you may have acquired here, really like what you’re stating and just how that you say it. You will be making it enjoyable and you still take care of to maintain it sensible. while i found this article at this particular website. Very descriptive blog, I liked that a good deal. Will there be considered a part 2? Thanks DelQSilbaugh .I am glad you like the Information. Thanks AleishaXPouk , I am glad you like the Information we are trying to convey.